Barra de São Miguel is right opposite the Praia do Gunga, an exceptionally beautiful white sandy stretch of beach protected by an offshore reef. The reef means that the waters here are calm - great for kayakers as well as swimmers. The best places to stay in Barra de São Miguel are generally pousadas, but our Gurus have also found a rather nice spa resort to include on our list. At its busiest the sands of Praia do Gunga are littered with towels and bronzed limbs and you can even take a dune buggy ride. And the waters are dotted with kayaks and other small crafts. There are larger boats docking at regular intervals from local towns and several open air restaurants in the harbourside. Aside from going to the beach, Barra de São Miguel also has several look outs offering wonderful beach views. Just behind and beside the town grows tropical rainforest. But this is very much a beach break destination. The lovely beaches that are great to walk along, adventure on dune buggies, or to relax and just sunbathe! A large tropical rainforest just outside the town gives a great opportunity to explore the South American wildlife close up! Our pick of the best places to stay in Barra de Sao Miguel is ideal for anyone looking for total relaxation. The Kenoa Beach & Spa Resort is a strikingly designed 23 room hotel with exceptional views of the ocean and lush surrounds. You’re right by the beach, but there’s also a pool. And a wine bar and spa, and a restaurant serving modern Portuguese cuisine. The closest international airport is Recife, 280 km away. For domestic flights, Maceio is 58 km away. Between October and March is the best time to visit the area, with the least amount of rainfall and the best temperatures. The temperature in this period varies from 28 to 32 degrees in the daytime. Browse through our list of all the best places to stay in Barra de São Miguel. 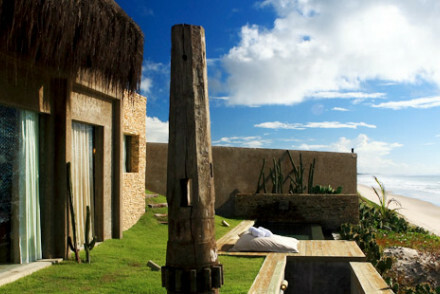 This sensational property is owner Pedro's first venture into hospitality. Striking yet sympathetic to its natural surroundings local wood and stone is juxtaposed with glass, clean lines and panoramic views! Cuisine is modern with a Portuguese influence. There is also a wine bar, spa and pool. Local markets - Live like the locals and head to the Mercado do Artesanato. Open daily. Great walks - There is nothing better than a sunset stroll along the beach.